Patients want large reductions in pain intensity (typically at least 50%, ideally no worse than mild pain6), with relief from associated problems such as sleep disturbance and depression but without common adverse events interfering with treatment. Those who get better (responders) do well: recent individual patient analyses for chronic pain interventions have shown that people who respond experience improvements in fatigue, depression, and sleep interference,7 8 9 and general measures of function and quality of life,8 9 including ability to work.10 Non-responders have none of these benefits. This message is easy to communicate. An important feature of responder analysis, reflecting clinical practice, is that everyone who withdraws from a trial for any reason is unequivocally a non-responder: if you don’t take the tablet you don’t get pain relief. This eliminates the need to assign efficacy results to people no longer in trials and eliminates the considerable bias inherent in the statistical practice of imputing missing data.11 Imputation methods may be justified in establishing whether interventions have analgesic effects but not when determining clinical effectiveness. We propose that the scientific assessment of analgesia and the clinical practice of analgesic delivery could be simplified into three guiding principles: measure pain in individual patients, expect analgesic drugs to fail to provide a good response in most patients, and prepare for the next step when failure occurs. The table⇓ shows drug specific success and failure rates for postoperative pain, migraine, and chronic musculoskeletal and neuropathic conditions. Data came predominantly from Cochrane reviews or overviews, or individual patient data meta-analyses using sensitive trials in patients with initial pain of moderate or severe intensity. The reviews were done to the highest current standards,12 avoiding known risks of bias, and with sufficient data to minimise random chance effects.13 All reviews used a responder definition of at least 50% pain relief or its equivalent. When possible we did not use trials that had imputed data by carrying the last observation forward, but for painful diabetic neuropathy and postherpetic neuralgia, these were the only data available for most drugs. The size of response rates with placebo depends on the outcome (lower placebo rates with tougher outcomes), duration (in chronic pain trials), and pain condition studied. We therefore calculated the maximum possible success as 100%−placebo response and drug specific success as active response−placebo response. The success rate was calculated as a percentage of maximum possible response. The magnitude of the failure to achieve good pain relief, especially over the longer term in chronic pain, is sobering. The high failure rates are a consequence of using patient centred definitions of benefit combining high level of pain relief with tolerable adverse events, using higher standards of evidence, and avoiding major imputation bias. These higher standards are backed by considerable evidence supporting their validity. Use of responder analysis changes judgments of benefit and risk. With failure, patients without benefit should be exposed to no risk because the drug is stopped; only effective drugs should continue to be prescribed. With success, considerable benefits in terms of pain relief, sleep, fatigue, depression, function, and quality of life are balanced against rare risk of serious harm. Average benefits have no part in these discussions. 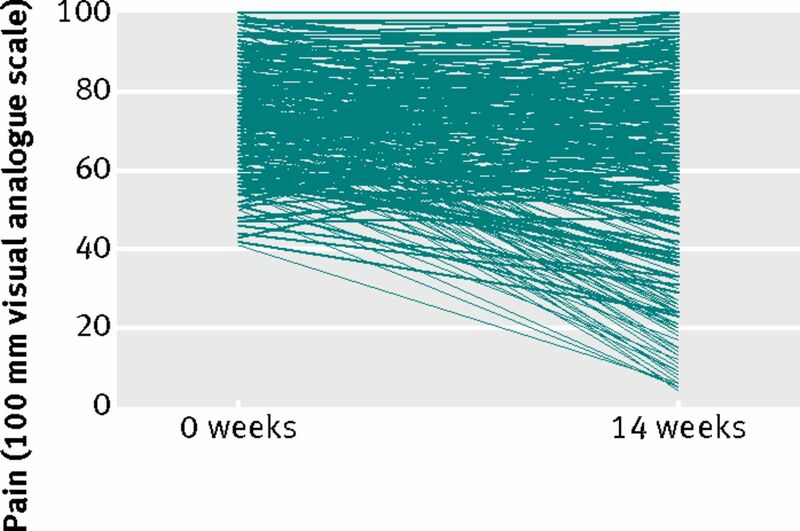 The good news is that success is often achieved within the first two weeks or so of treatment or not at all,14 15 and when achieved, tends to last. Drug therapy is rarely the only treatment used in chronic pain, but clinical trials designed for regulatory purposes force us into considering single interventions. Randomised withdrawal trials may reflect the real world more accurately and be a better test, but with only a single example this is speculation. The principles of treatment should be to measure pain, expect and recognise analgesic failure, and to react to it, pursuing analgesic success rather than blindly accepting failure. In any condition, the order in which analgesics should be tried is predicated on efficacy and safety, and adjusted for individual patient characteristics. Regulatory authorities also need to recognise that failure is the norm. European regulators, unlike their US counterparts, have refused to license any drug in fibromyalgia because of inadequate average effect size, ignoring the fact that these drugs work well (≥50% reduction in pain intensity) in around 10% of patients with this difficult to treat condition. New drugs are unlikely to be much better. A change in regulatory attitude is overdue, would be sensible, and will benefit patients. Chronic pain conditions are complex and associated with considerable comorbidity. Coupled with the intricacies of pain modulation, central nervous system changes, and genetic influences, high failure rates with single interventions are unsurprising. The new game in town is specificity of effect for specific targets, but with only a small percentage of patients benefiting. Randomised withdrawal designs seem promising,23 but there are few good examples, and they are not always accepted or understood. New designs are also important for non-drug interventions that produce substantial benefits in few patients, including complementary therapies. Embracing high failure rates is the first step to doing better with what we have. Pronouncing about the importance of failure is rare in science. We believe that pain medicine has now reached a degree of maturity where it can confront its failings. We propose a radical transformation in how we establish analgesic efficacy and harm. Clinically this means expecting analgesic failure, assessing pain, and understanding options for stopping and switching. For the drug industry, regulators, and researchers this means casting aside our slavish reliance on the average, and asking what works for whom in what circumstance, recognising that population improvements in overall effect will require access to numerous treatment options to achieve pain relief for the individual. Contributors and sources: RAM is chairman of a special interest group on systematic reviews for the International Association of the Study of Pain and a Cochrane editor; SD is a Cochrane editor; CE is coordinating editor of the Pain, Palliative, and Supportive Care Cochrane Review Group; EK is professor of pain medicine at the University of Helsinki. RAM is the guarantor. All data used are from Cochrane or non-Cochrane reviews meeting the same rigorous standards, and where in a few cases evidence is not sufficiently rigorous this is highlighted. Competing interests: All authors have completed the unified competing interest form at www.icmje.org/coi_disclosure.pdf (available on request from the corresponding author) and declare: no support from any organisation for the submitted work; CE has received consultancy or lecture fees from Reckitt Benkiser, Napp Pharmaceuticals, RAM has been a board member or received consultancy or lecture fees from Reckitt Benkiser, Pfizer, MSD, Eli Lilly, Menarini, and Astellas. EK reports board membership or consultancy for Grünenthal, Pfizer, Janssen-Cilag, and Pharmaleads SAS. Connor S. Glaxo chief: our drugs do not work on most patients. Independent2003 Dec 8. www.independent.co.uk/news/science/glaxo-chief-our-drugs-do-not-work-on-most-patients-575942.html. Smith R. The drugs don’t work. BMJ2003;327:.9. Moore RA, Straube S, Paine J, Derry S, McQuay HJ. Minimum efficacy criteria for comparisons between treatments using individual patient meta-analysis of acute pain trials: examples of etoricoxib, paracetamol, ibuprofen, and ibuprofen/paracetamol combinations after third molar extraction. Pain2011;152:982-9. Moore RA, Smugar SS, Wang H, Peloso PM, Gammaitoni A. Numbers-needed-to-treat analyses—do timing, dropouts, and outcome matter? Pooled analysis of two randomized, placebo-controlled chronic low back pain trials. Pain2010;151:592-7. Moore RA, Moore OA, Derry S, Peloso PM, Gammaitoni AR, Wang H. Responder analysis for pain relief and numbers needed to treat in a meta-analysis of etoricoxib osteoarthritis trials: bridging a gap between clinical trials and clinical practice. Ann Rheum Dis2010;69:374-9. Moore RA, Straube S, Aldington D. Pain measures and cut-offs—“no worse than mild pain” as a simple, universal outcome. Anaesthesia2013;68:400-12. Arnold LM, Wang F, Ahl J, Gaynor PJ, Wohlreich MM. Improvement in multiple dimensions of fatigue in patients with fibromyalgia treated with duloxetine: secondary analysis of a randomized, placebo-controlled trial. Arthritis Res Ther2011;13:R86. Hoffman DL, Sadosky A, Dukes EM, Alvir J. How do changes in pain severity levels correspond to changes in health status and function in patients with painful diabetic peripheral neuropathy? Pain2010;149:194-201. Moore RA, Straube S, Paine J, Phillips CJ, Derry S, McQuay HJ. Fibromyalgia: Moderate and substantial pain intensity reduction predicts improvement in other outcomes and substantial quality of life gain. Pain2010;149:360-4. Straube S, Moore RA, Paine J, Derry S, Phillips CJ, Hallier E, et al. Interference with work in fibromyalgia: effect of treatment with pregabalin and relation to pain response. BMC Musculoskelet Disord2011;12:125. Moore RA, Straube S, Eccleston C, Derry S, Aldington D, Wiffen P, et al. Estimate at your peril: imputation methods for patient withdrawal can bias efficacy outcomes in chronic pain trials using responder analyses. Pain2012;153:265-8. Moore RA, Eccleston C, Derry S, Wiffen P, Bell RF, Straube S, et al. “Evidence” in chronic pain-establishing best practice in the reporting of systematic reviews. Pain2010;150:386-9. Moore RA, Gavaghan D, Tramèr MR, Collins SL, McQuay HJ. Size is everything—large amounts of information are needed to overcome random effects in estimating direction and magnitude of treatment effects. Pain1998;78:209-16. Stacey BR, Barrett JA, Whalen E, Phillips KF, Rowbotham MC. Pregabalin for postherpetic neuralgia: placebo-controlled trial of fixed and flexible dosing regimens on allodynia and time to onset of pain relief. J Pain2008;9:1006-17. Wang F, Ruberg SJ, Gaynor PJ, Heinloth AN, Arnold LM. Early improvement in pain predicts pain response at endpoint in patients with fibromyalgia. J Pain2011;12:1088-94. Crofford LJ, Mease PJ, Simpson SL, Young JP Jr, Martin SA, Haig GM, et al. Fibromyalgia relapse evaluation and efficacy for durability of meaningful relief (FREEDOM): a 6-month, double-blind, placebo-controlled trial with pregabalin. Pain2008;136:419-31. Lin HY, Cheng TT, Wang JH, Lee CS, Chen MH, Lei V, et al. Etoricoxib improves pain, function and quality of life: results of a real-world effectiveness trial. Int J Rheum Dis2010;13:144-50. Watson CP, Vernich L, Chipman M, Reed K. Nortriptyline versus amitriptyline in postherpetic neuralgia: a randomized trial. Neurology1998;51:1166-71. Kroenke K, West SL, Swindle R, Gilsenan A, Eckert GJ, Dolor R, et al. Similar effectiveness of paroxetine, fluoxetine, and sertraline in primary care: a randomized trial. JAMA2001;286,2947-55. Simon G. Choosing a first line antidepressant. Equal on average does not mean equal for everyone. JAMA2001;286:3003-4. National Institute for Health and Clinical Excellence. Neuropathic pain: the pharmacological management of neuropathic pain in adults in non-specialist settings. 2010. www.nice.org.uk/guidance/CG96. National Collaborating Centre for Chronic Conditions. Osteoarthritis: national clinical guideline for care and management in adults. Royal College of Physicians, 2008. McQuay HJ, Derry S, Moore RA, Poulain P, Legout V. Enriched enrolment with randomised withdrawal (EERW): time for a new look at clinical trial design in chronic pain. Pain2008;135:217-20. Moore RA, Derry S, McQuay HJ, Straube S, Aldington D, Wiffen P, et al. Clinical effectiveness: an approach to clinical trial design more relevant to clinical practice, acknowledging the importance of individual differences. Pain2010;149:173-6.